What It’s About: Private eye Mike Church (Kenneth Branagh) takes on the case of a mysterious woman (Emma Thompson) suffering from amnesia found on the grounds of the orphanage he grew up in. Church dubs her Grace and places an ad in the paper to try to find out if anyone is missing her. A strange antiques dealer (Derek Jacobi) answers the ad and uses hypnotic regression to discover Grace’s past life. Church and Grace begin to believe that they are the reincarnations of Roman and Margaret Strauss. Composer Roman was executed for murdering Margaret…but was he really guilty, and what does Church and Grace’s meeting in the present mean? Why Watch it Today? : The Strauss trial ends on December 10th, 1949, as seen on newspaper headlines in the film. 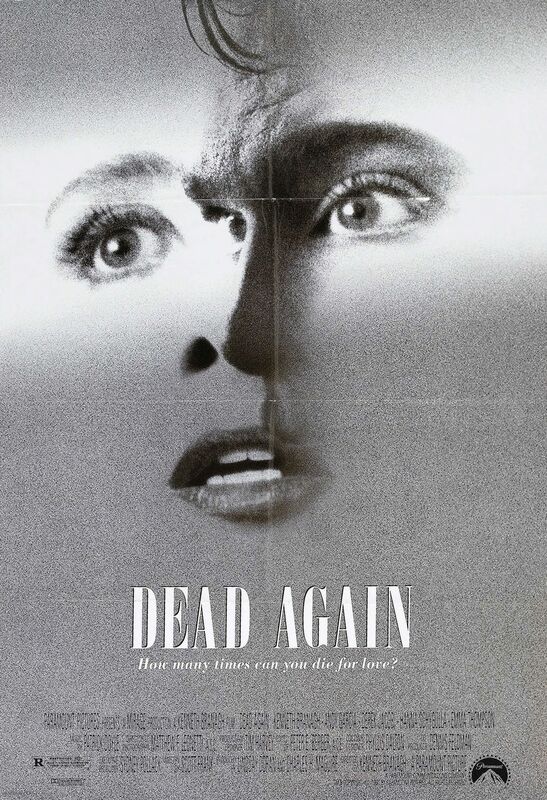 Dead Again is a delirious misfire of a Neo Noir starring Shakespearean actors and, to make sure we know it was made in 1991, random bits featuring Robin Williams as a filthy mouthed, dirty minded fallen psychologist who now works in the goriest butcher department to ever grace a supermarket. The black and white previous life sequences are beautifully directed (by Brannagh) and acted, which only makes the modern scenes seem more goofy (though to give the devil his due, if you watch this without knowing any of the twists you are in for a good time and some surprises). If nothing else, the film is worth watching for Branagh’s ridiculous “American private eye” “accent”, but if that doesn’t sell you, how about a randomly kick boxing Campbell Scott? This entry was posted in Black and White, Detective, Movie of the Day, Mystery, Period Film, Thriller, Whodunnit and tagged amnesia, Andy Garcia, artists, bad makeup, before they were famous, butcher, Campbell Scott, composer, courtroom scene, Derek Jacobi, dual role, electric chair, Emma Thompson, execution, flashback, Hollywood, hypnosis, Kenneth Branagh, Los Angeles, maid, masquerade, murder, nun, orphanage, photographer, priest, psychologist, refugees, reincarnation, reporter, scissors, supermarket, Sydney Pollack, trial, twist, Wayne Knight. Heh. I’ve never quite liked this as much as some people I know and yeah, Branagh’s “accent” is ear-drilling in a “Loowuk, Eye’m Doin’ An Ammericaan Voyce, Seee!” manner that I found way too distracting. Still, the b+w parts are lovely! See, for me the accent was on of the most enjoyable things in the movie-just hilariously silly.